Mother's Day is coming up shortly- Sunday, May 13th. Every Mom deserves to be pampered. 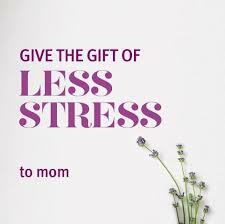 Why not treat her with the Aveda gift of Less Stress. How? Aveda's Stress Fix Aromatherapy is the perfect gift. It is clinically proven to relieve feelings of stress and is Ecocert-certified organic. Stop by any of our three Aveda salons and experience the aroma of organic lavender, clary sage and lavandin.